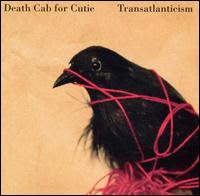 After Transatlanticism, there was no way Death Cab for Cutie weren't going to break into the mainstream. Besides the stellar songwriting and instrumentation, it had all the subtle indicators of a classic album, from the pacing to the running order to the transitions and right down to the evocative cover art. A man who knows his way around the picket fence, Ben Gibbard essays suburban dramas --- where a broken vase means so much more than a spill to clean up --- and he doesn't spare himself when wielding the lens. "We Looked Like Giants" communicates its gnawing angst in the opening dull tone from Nick Harmer's bass, with piano cautiously moving in before --- crash! --- the band streak out in a burst. Jason McGerr's snare cracks and the fulminating guitars of Gibbard and Chris Walla yank us from the aerial view to arm's length. We can see the gray subcompact. We can smell the cold mountain air. We can feel the emotions churning in his stomach as he approaches real intimacy with the woman in the backseat. And yet ... there's always that distance. In the epic title track, he equates it to the Atlantic Ocean: "too far for me to row." McGerr gradually boosts the intensity of his playing, and the others follow suit, Walla repeating the central guitar riff and Gibbard calling across the sea, "I need you so much closer. I need you so much closer." They come back stronger every sequence and join in a chorus of "Come Onnnnnnnn! Come Onnnnnnnnn!" until the music is crashing down upon us, a monolithic force of passion and ambition. The distance doesn't matter. We know he'll get there.